This past weekend we made a quick trip to Austin. Sheena was up there already for a work event, so Layla and I met her up to make a weekend of it. See my Megabus post to learn about our adventure up there! Friday after we came into town, Sheena scooped us up from campus and we made our way to Aaron and Nancy’s house. Aaron is one of my close friends from waaaaayyy back. They had poker night and invited a few friends. We know them as well, so it was fun to catch up and hang with good peeps. Saturday morning Aaron and I headed to the driving range and hit a few golf balls. I’m not that into golf, but it was awesome to just be outside, randomly knocking the crap outta some golf balls and chatting with an old friend. 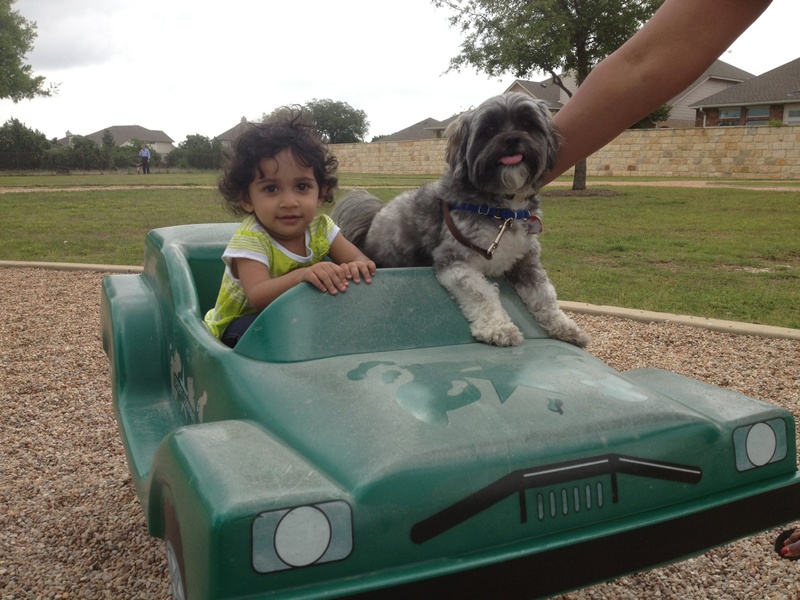 While Aaron and I were at the range, Nancy, Sheena, Layla and Zoe went to a close by park. Layla took a major liking to Zoe. 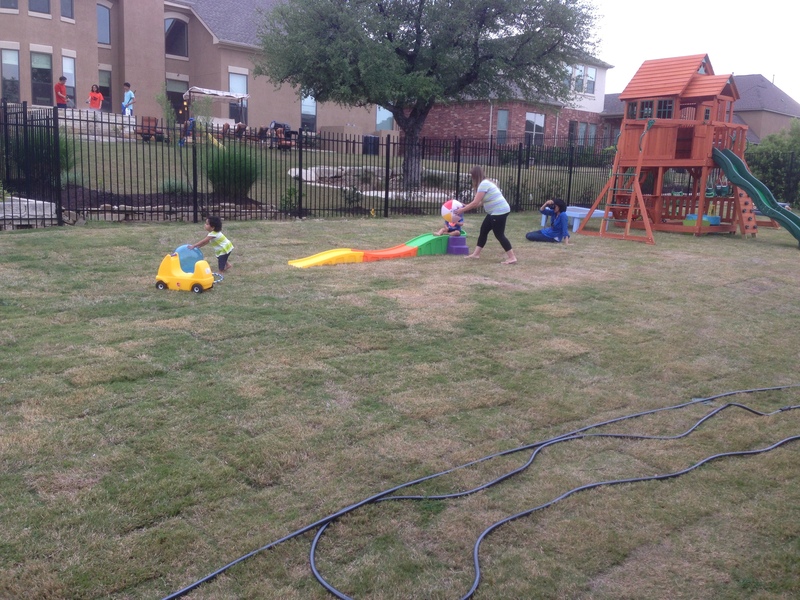 Afterwards, we all regrouped back at the house. Nancy was busy lining up where we could go get some lunch. The goal was food trucks. The decision: South Congress. 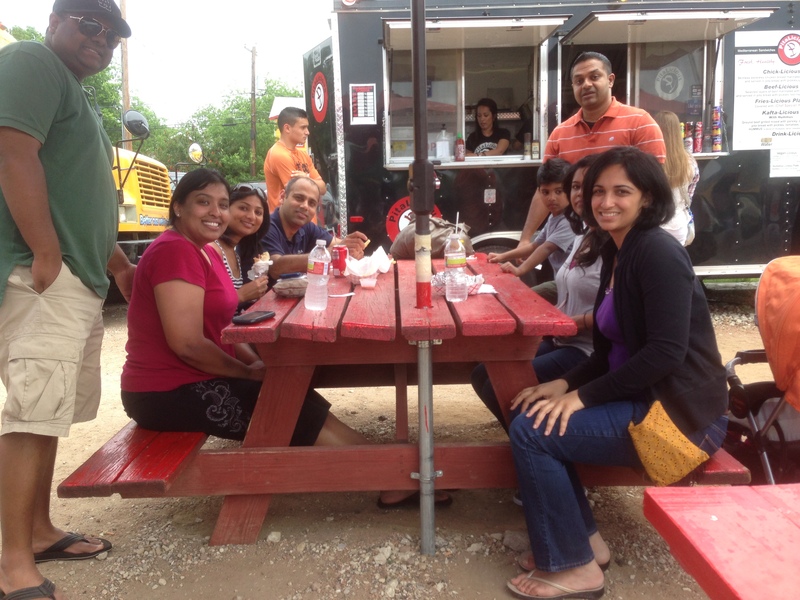 Since the weather was nice, the entire city of Austin was out and about! It was great. 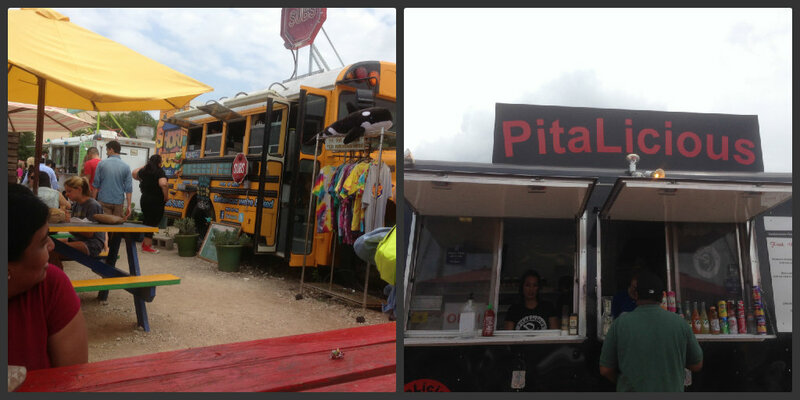 We pulled up to S.Congress and walked to a lot full of food trucks! Some friends joined us as well! We went back to home base to freshen up. We’ve been out all day, so it was nice to chill for a bit before we headed out again. 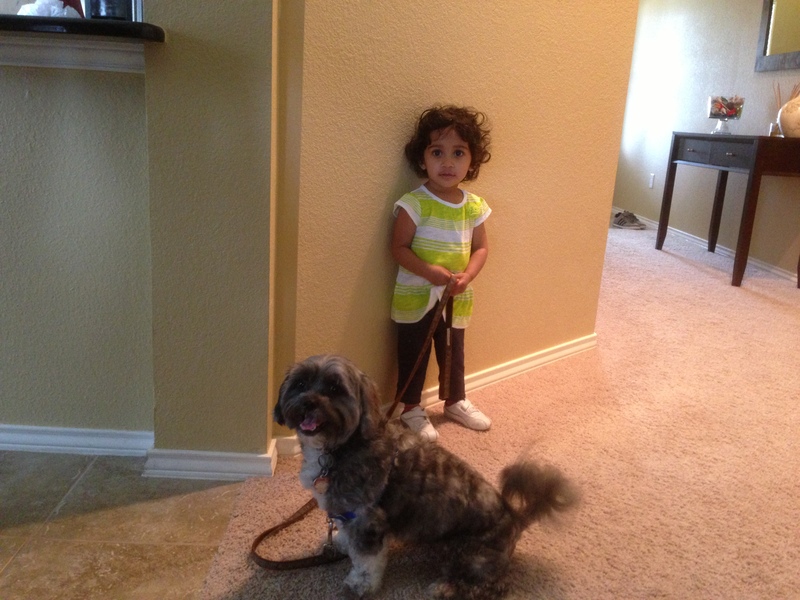 Then we made the trip out to Samir and Mindy’s house. 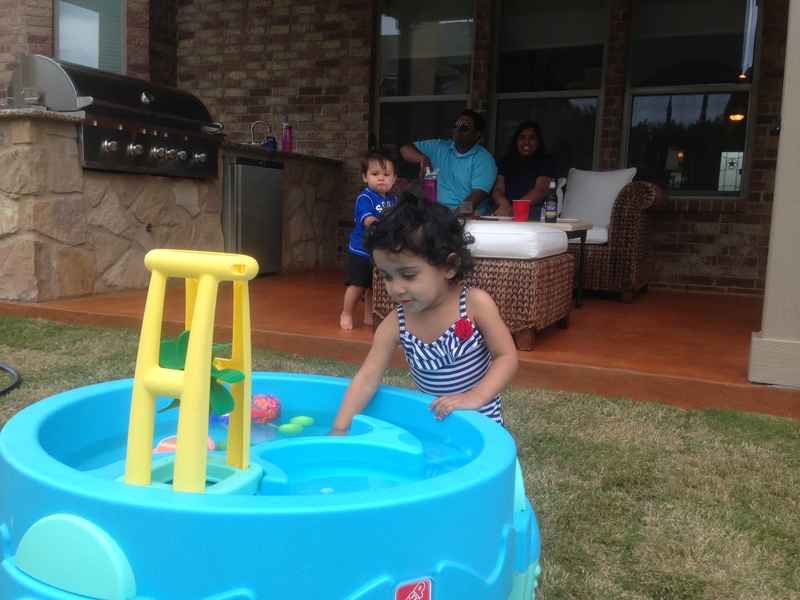 Samir said he was filling up the kiddie pool, so we made a quick stop to grab a swimsuit for Layla. Their house is amazing! It was great to catch up with them as well. Layla had fun with all of Riza’s toys! Below you see preggo Mindy keeping active with Riza while Sheena snaps pics of it all! 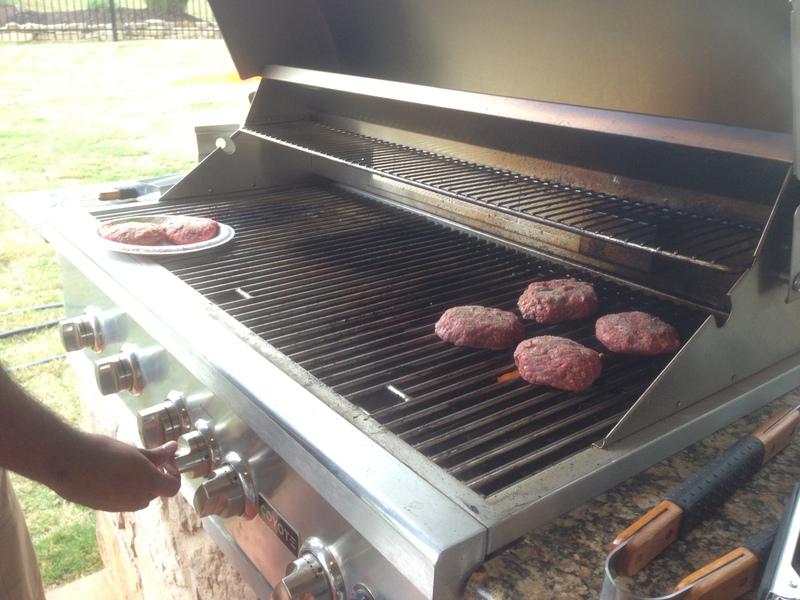 While the kiddos were playing, Samir was busy grilling. 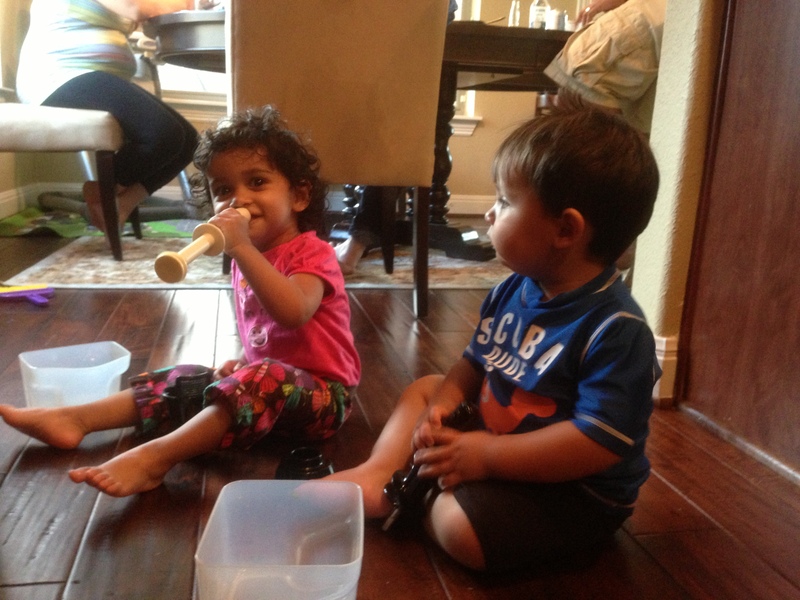 Even though there were a sea to toys, Riza and Layla wanted to play with parts of their juicer. 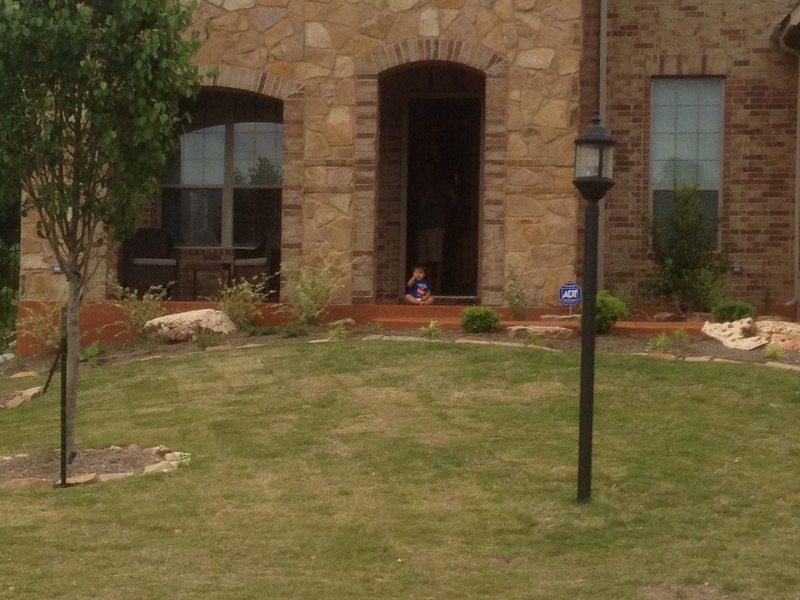 When we left, Riza stayed out and waved good-bye. The views of Austin are awesome! Although I’ve been to Austin numerous times, it still amazes me driving through it. Throughout the entire weekend, no matter where we drove, the views were great! Sunday, we woke up to a deluxe breakfast made by the very sweet Nancy. Our plans were to head back to Houston right after church, so after breakfast and a little bit of chill time, we said our farewells and headed out to church. Sheena recently held a banquet for work where Jimmy McNeal performed. 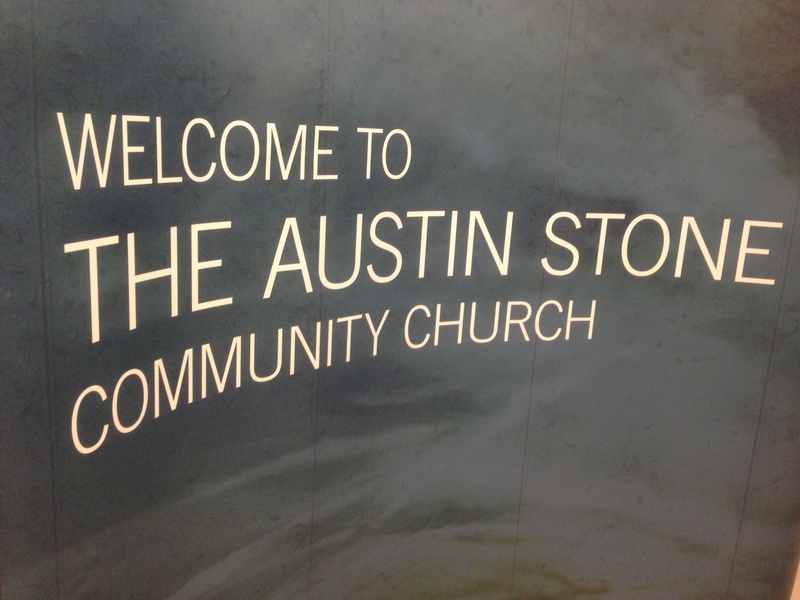 He’s the lead worship guy at Austin Stone, so we decided to check it out. Their church is held at Stephen F. Austin Highschool It was a great service. We caught the 11am service and it was packed! If you’re looking for a church while up in Austin, I would highly recommend it! Lance, Sheena’s old friend, joined us for service and Andrew, Sheena’s cousin, attends that church as well. 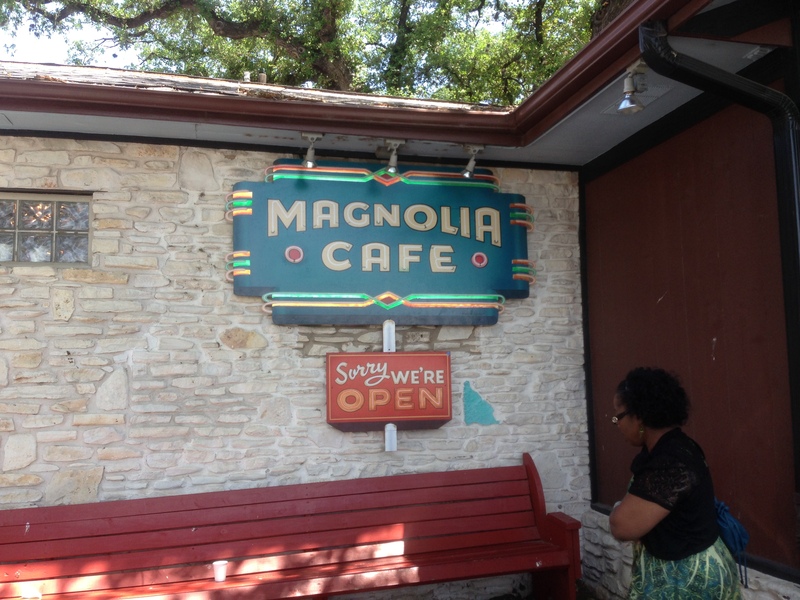 After service, we all went for lunch at Magnolia Cafe. Usually I’m in a rush to get back to Houston to get ready for the week, but it was nice to take it slow and have a meal with Lance and Andrew. After lunch and good conversation, we hit the road and made our way back home. Austin never disappoints. I don’t know if it’s the people we have out there, the weather, the landscape, the culture, or a combination of it all. 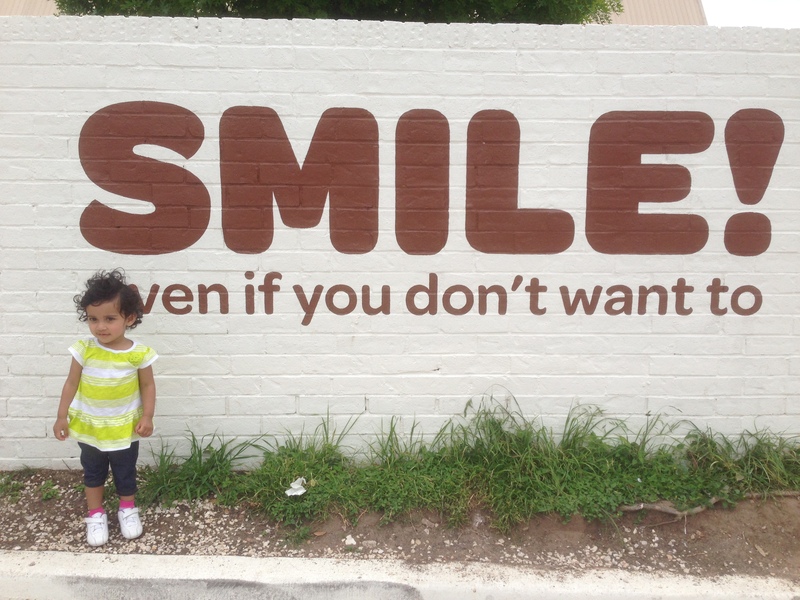 Either way… Austin, you’re cool. Next Post Cinco de MAYA! I think the most impressive thing is Samir’s house! 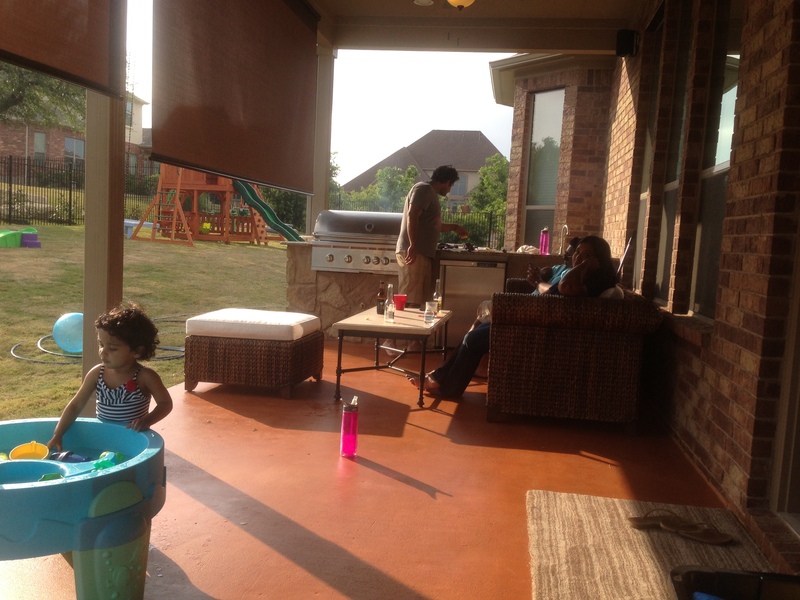 Their backyard looks amazing.